InVogueJewelry: Goldstone. Sun Sitara. Stellaria. Midnight Goldstone. WHAT IS IT? Goldstone. Sun Sitara. Stellaria. Midnight Goldstone. WHAT IS IT? I first laid eyes on Goldstone when I was 9 years old, when my family stopped at Wall Drug in South Dakota. I saw a barrel full of these little Goldstone nuggets, and I couldn't believe how beautiful they were! I was always a rock collector, but I never saw anything like that before. My parents bought me a goldstone ring that day, and it was the greatest treasure! I still have that ring. It was mesmerizing---like frozen liquid filled with gold sparkles. I always thought the suspended sparkles were actual pieces of gold, or something like "fool's gold" since it's called "goldstone". 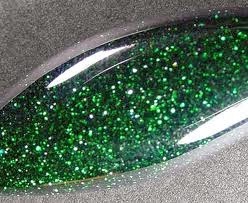 I only knew for sure that it was the most beautiful stone I ever saw! But is it a gemstone? What is goldstone? Is there gold in it? Is it a stone? It's actually GLASS. It's not a gemstone at all! It's a glittering glass that can be polished or carved! I've seen carved goldstone roses and Buddhas and all sorts of other shapes. 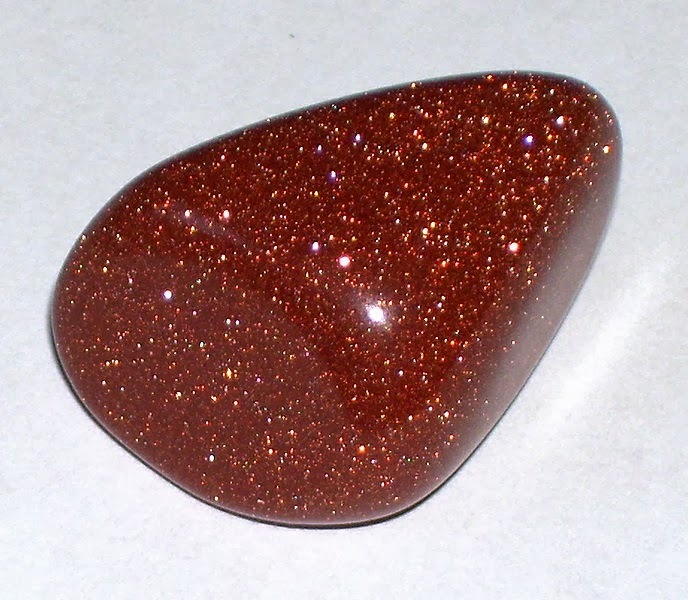 Goldstone is often misrepresented as a gemstone, and even formed into "crystal point" shapes as if it grew that way! 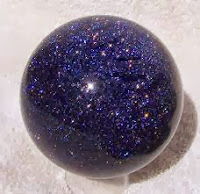 Midnight blue goldstone is often misrepresented as Lapis Lazuli, which is a navy blue gemstone but looks nothing like Goldstone otherwise, especially in person. It's sometimes called "Lapis Lazuli Glass" but that's really not correct either, as it's not at all related to Lapis. Goldstone has a Mohs hardness of 5-6, about the same as window glass. It is sometimes called Stellaria or Sun Sitara. Sitara means "star" in Persian due to the star-like glitter inside. Sometimes it's called Monkstone or Monk's Gold, based on the legend of its formation: Italian monks in 17th Century Venice were trying to "make" gold out of copper, and Goldstone was produced. A very happy accident! First, it's NOT made by tossing glitter into molten glass! It's much more complicated than that. The most common form of Goldstone is reddish brown with tiny crystals of metallic copper. These flecks appear only under specific conditions. Silica, copper oxides and other oxides are melted together. The vat is then sealed off from the air (a vacuum chamber) and kept at a certain temperature, so the glass remains liquid while allowing copper crystals to form without the crystals melting or oxidizing! When cooled, the glass will have bright metal crystals suspended in semi-transparent glass. results in blue goldstone with gold and silvery glitter. It's navy blue to black-blue and the silvery sparkles inside the glass makes it look a like the Milky Way galaxy. 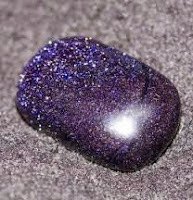 Using Manganese results in purple goldstone (pic below). There is also green goldstone, also knows as "chrome aventurine" although it's glass, not aventurine, but the green is due to sparkling chromium oxide particles. Sellers claim the green goldstone is "rare", like it's formed in nature, but it's not rare---it's just not manufactured as often as the far more popular blue and brown colors of goldstone. itself is basically clear so it's very unusual and fascinating to stare at! However, be aware that it is NOT a "semi precious gemstone" as it is described by jewelry shops online. It does not grow as a crystal. It is NOT "Blue Sandstone" described as "composed of quartz or feldspar because these are the most common minerals in the Earth's crust. The sand inside creates the blue color. For this reason, this substance is named "Blue sandstone," which I just saw on Etsy. (WOW---that's really an example of FRAUD!) It's not a gemstone at all. It is in the same category as "opalite" or "hydro quartz" or "fused quartz"--- GLASS. Pretty, but just manmade glass, even though actual elements (copper, etc.) are used to make it and actual crystalized copper is what provides the sparkle---all embedded in glass. I saw little strands of blue goldstone disc beads at Michael's this weekend, for $3.99. They are marked "glass beads" if you look closely at the hang tag, and are found in the area reserved for other glass beads and Swarovski crystals---not even in the gemstone section. Too bad some sellers online aren't as honest as Michael's! But now YOU know! Thank you for an excellent history on Sun Sitara. Thank you for reading my blog! And thank you for your comment! Gold Filled or Gold Vermeil: Which Is Better?